Choosing where to go out and eat can be a difficult decision – especially if there’s a few of you that all seem to have completely different tastes! The Terrace Restaurant in Llandudno might just be what you are looking for, with its wide range of dishes to choose from, both at lunchtime and dinner. Not only is the food fantastic – the Terrace Restaurant is decorated beautifully. Murals of the glamorous Lake Como extend the length of the restaurant; floral chandeliers hang from the ceiling, with table décor to compliment these features. 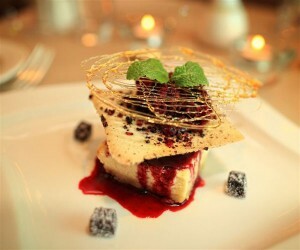 On the evening dinner menu, you can expect to find some truly mouth watering dishes. From pan roasted medallions of local venison to large field mushrooms stuffed with Mediterranean vegetables and goat’s cheese, there’s a dish to suit every palate. There’s also a very delicious dessert range for those with a sweet tooth. Homemade key lime pie, sticky toffee pudding and banoffee pie are just a few of the tasty treats available to try on the dinner dessert menu. The Terrace also offers a special lunch menu, where you can have a two course meal for a very reasonable £8.95! The main courses on the special lunch menu typically include dishes such as a homemade vegetable curry, Orme view dressed crab with salad and a bacon and Snowdonia cheese melt on ciabatta. Their Friday steak night lets guests get their teeth into a meaty sirloin, pork or gammon steak, with a bottle of wine included. The cost of £24.95 covers two people, so bring a friend with you or take your partner out for the night. 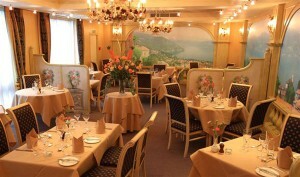 The Terrace Restaurant is part of the St. Tudno Hotel, a boutique hotel in Llandudno. This delightful seafront Victorian hotel is only a 5 minute walk to the pier, and has previously been featured in the ‘Good Hotel Guide’.